Save big on some of your favorites at Kirkland's stores (US locations) and on the official website. 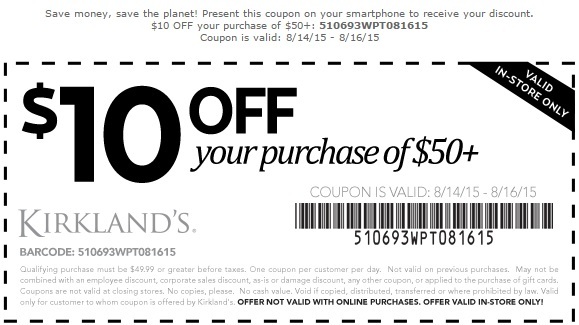 It's possible to save at Kirkland's stores with printable coupon. You will receive $10 discount on your purchase of $50 or more. Or, you can also save money online, even more than at Kirkland's stores. Just use a promo code SAVE20. Only one condition is necessary to receive the offer, you must spend $100 or more. Source of the information is Kirkland's. Offer ends on Sunday (08/16/2015). More information about the offer available at stores or online.